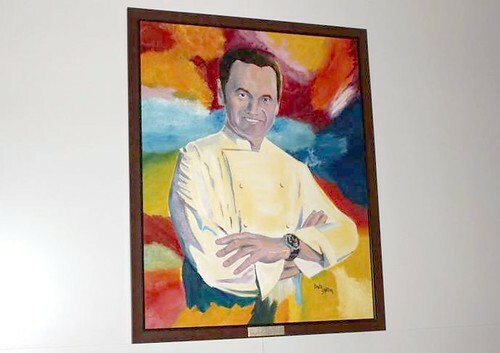 Of course, you have Wolfgang present, even if it is in the form of a painting. 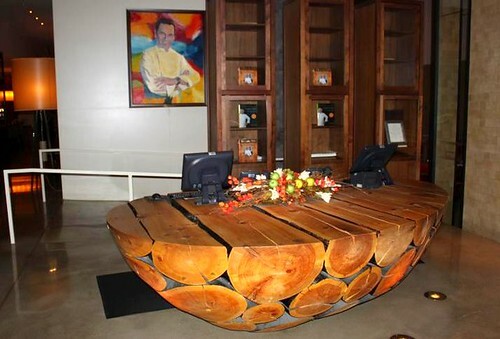 Also, the decor is modern, but warm, with dark wood tones and over sized lamps. Additionaly, the kitchen is visible from the dining room, so you can view the bustle of chefs in the back. 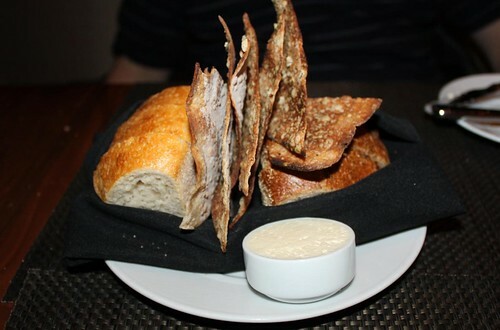 The bread on the table is a trio. A white, a gorgeous wheat olive bread, and a thin crispy herb bread. My favorite was the olive bread. It was superb. The Calamari ($11) was ah-mazing. It came with a sweet thai chili sauce. 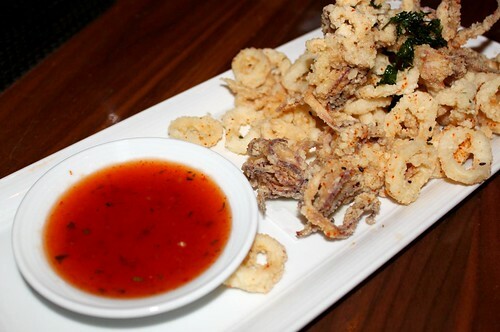 There is nothing worse than over fried chewy calamari. These were far from that. Mixed in were small little octopi that were fun to eat. 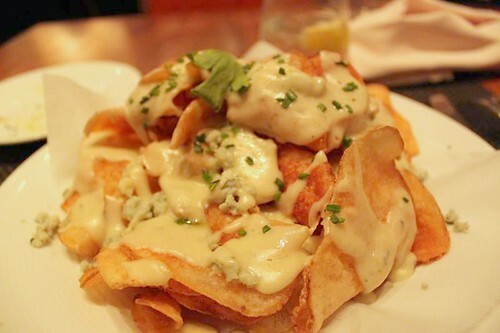 Also had the Truffled Potato Chips with Maytag Blue Cheese Sauce, Chives ($10). There was just something off about it. I’m a big blue cheese fan but this was not tasty at all. I actually sent this back. I can’t believe I’m saying that. But I really sent it back. 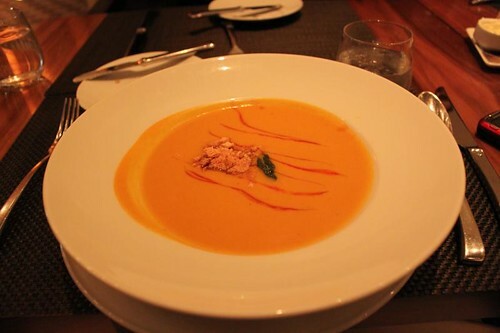 The butternut squash soup was divine ($9). Creamy and perfect with lots of flavor depth. 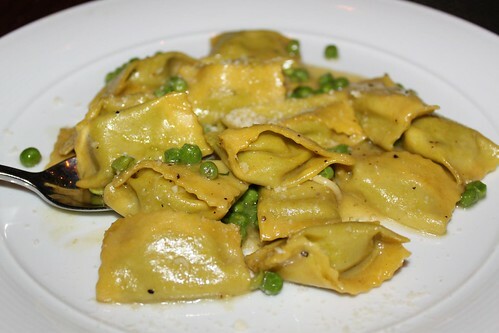 By far my favorite dish was the English Pea and Goat Cheese Ravioli ($15). Talk about a p-u-n-c-h of flavor. My hubby is not so much of a pea person and he loved it. I can’t wait to have it again. Its that good. 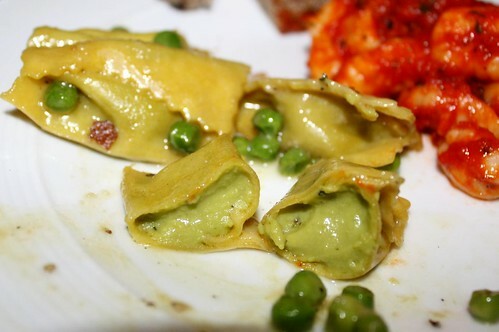 The pasta had a perfect bite to it, and the creamy pea filling as was flavorful, you had to savor each bite. 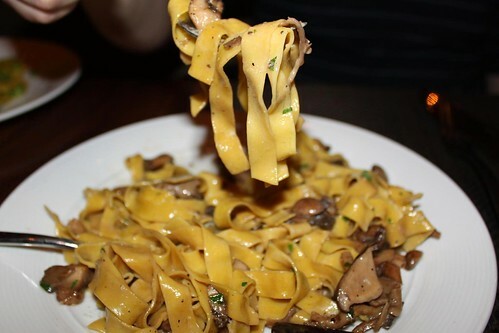 The hubby also like their Wild Mushroom Fettuccine with Cipollini Onions, Rosemary, Shaved Parmesan ($18). He had it on two of the occasions. Its very straightforward, simple and fresh. 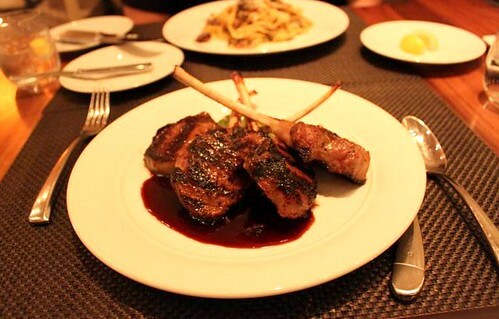 Mike, our friend had the lamb chops with a balsamic glaze ($45). He said they were some of the best he has ever had. I don’t believe those are on the menu. I think they were a chefs special that night. Last time we had the house made Ricotta Gnocchi, Italian Sausage Bolognese, Fresh Basil ($17). We ordered it without the sausage bolognese and with their vegetarian tomato sauce. 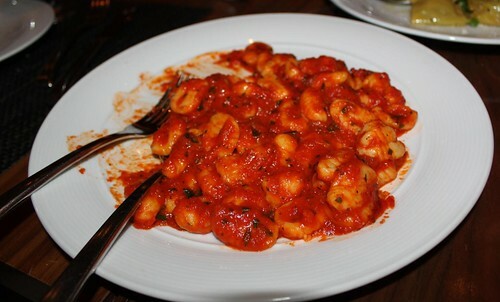 This was the lightest gnocchi, so pillowy and soft. The sauce was good, but a little strong. I can’t really complain about it though, since we had modified the dish. It was still pretty good though. On our first visit ever to Wolfgang’s, it was fall I think, so, at that time they were offering their pumpkin ravioli, with a sage butter sauce. This, like the pea ravioli was so amazing and full of flavor. We actually went back and had this another time as well. Now, onto the desserts 🙂 Are you ready? You will want to lick the screen once we are done.lol. On one occasion we had the pecan pie. Wow. 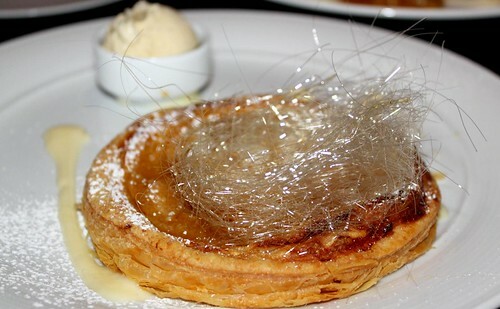 They only offered this for one week, and it had the vanilla cinnamon ice cream on it, with a sweet apple compote. The best pie I have ever had. And beautiful presentation at that. 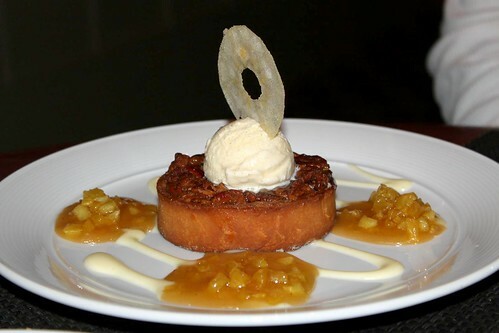 Michigan Honey Crisp Apple Tart, Almond Cream, House-Made 50 Bean Vanilla Ice Cream. The presentation on this was the only memorable thing. It was good, executed well, just nothing mind blowing. 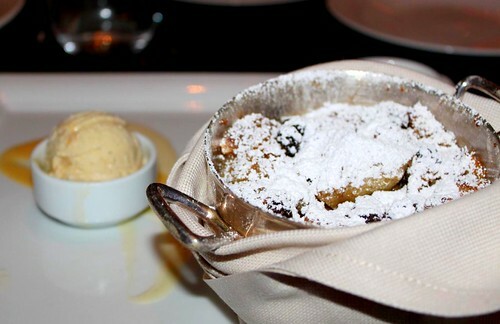 Also divine was the rum raisin bread pudding with vanilla ice cream, and I think it was a Jack Daniels sauce. I loved loved loved this. 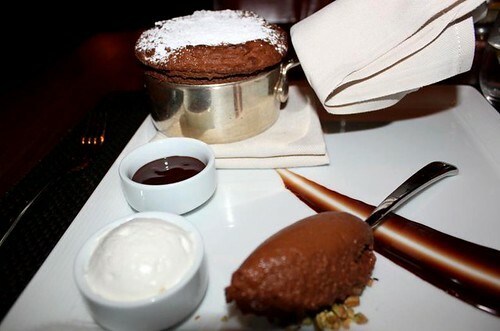 Warm, gooey and satisfyingly sweet. Chocolate Sorbet. THIS is a chocolate lovers dream. It was made with dark chocolate and not really sweet, which I loved. The sorbet had a little bitterness from the chocolate, that was perfect with the creme fraiche. 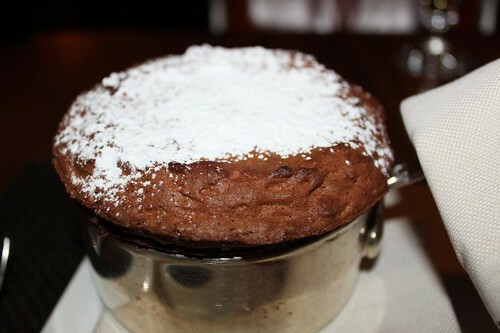 The souffle itself was presented so beautifully in a pan. It was light and airy, crispy on top and gooey on the bottom. 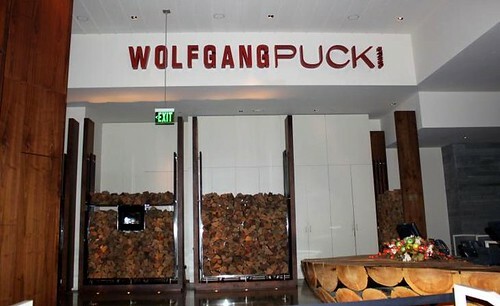 Wolfgang Puck Grille is a definite yes! Do yourself a favor and head down there. 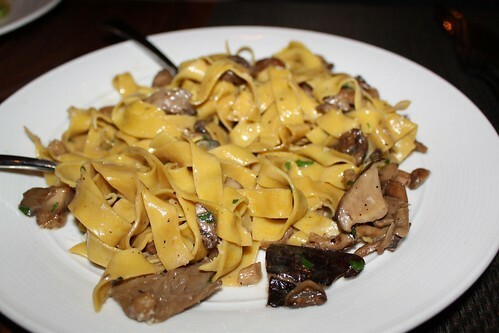 They also offer a priz fix menu on Sunday, Wednesday and Thursday and are always part of Detroit Restaurant Week. 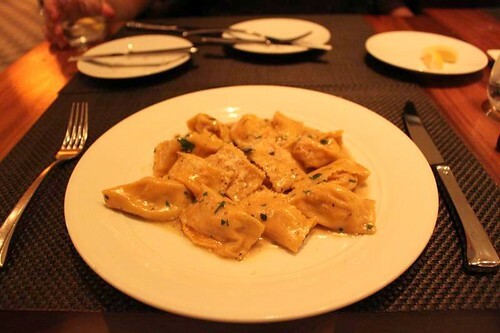 The ravioli is always fabulous, and this is a place where you don’t want to skip dessert. On all my visits, they have never let me down and continue to impress.